Johnny Óg Connolly and his father Johnny who is credited with reviving the melodeon. “My father used to say to me, “play the melodeon, take it up”, but I always preferred the two-row accordion because there was so much more you could do with it,” says musician and composer Johnny Óg Connolly, smiling at the irony. Because this Saturday night, the Connemara man, who is hugely regarded for his accordion-playing, will release his latest CD, Fear Inis Bearachain, at a session in Tigh Chualain, Inverin – and it’s a melodeon album. Fear Inis Bearachain was recorded in honour of his father Johnny Connolly, the man who is credited with reviving this single-row instrument in Connemara and further afield. “I always said I’d play it when he wasn’t around and, in a way, that’s true,” says Johnny Óg, referring to the Alzheimer’s Disease which in recent years, has ravaged his father’s mind. Not for nothing is it called the living death, he observes. Johnny and his father’s close relationship was forged mainly over music, he says, as they were very different personalities. And while he grieves the absence of the man who ferried him to sessions and fleadhs throughout his childhood, Johnny is eternally grateful for the gift they shared, which allows him pay omós, in his own special way, to Sean Johnny. The album title refers to his father’s birthplace on the island of Inish Bearachain where music was central to people’s lives – there was little else by way of entertainment, Johnny Óg remarks. As a young man, his father emigrated to England, returning to Connemara in 1976 with his wife Patricia and young family. Although Johnny Connolly later became renowned for his wonderful, effortless and graceful playing of the single-row melodeon, he didn’t play it at all when his children were young. 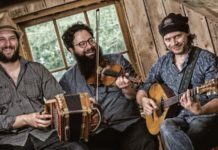 Johnny Óg recalls that his dad did pick it up one night during a Celtic festival in Lorient, encouraged by his friend and fellow musician, Meaití Jó Shéamuis Ó Fáharta, and got a great reaction. Then, after a work accident meant he had to take six months off, Patricia bought her husband a melodeon. It became a life-defining gift.